The birth of Kuwait Petroleum Corporation (KPC) is rooted in a saga that is worthy of an epic drama. KPC is a child of the turbulent 1970s, when conflict scarred the Middle East. 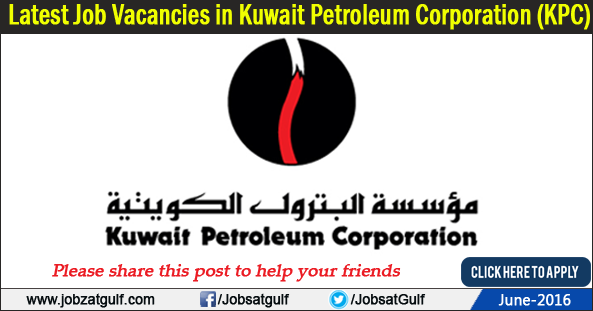 Kuwait Petroleum Corporation is Kuwait's national Oil and Gas company with international presence. A performance-based company entrusted to optimize the value of Kuwait's hydrocarbon resources through effective integrated value chain activities. And seeks to care for the interest of stakeholders and the environment of the communities where it operates. Academic: Bachelor degree in Chemical/Petroleum/Industrial/Mechanical Engineering or other related discipline. Related Work Experience: 10 years varied experience in strategic planning/performance management in an oil industry, out of which at least 4 years in a supervisory position. Related Work Experience: 8 years varied experience in strategic planning/performance management in an oil industry. Academic: Bachelor’s degree in Accounting/Finance or other related discipline. Related Work Experience: 8 years’ experience in Payables / Marine Accounting/ costing functions, preferably in an Oil Industry. Related Work Experience: 8 years’ varied experience in Sales Accounting activities preferably in an Oil Industry. Related Work Experience: 8 year’s varied experience in general accounting functions preferably in oil industry. Academic: Bachelor’s degree in Marine/Mechanical Engineering/ Marine Transportation (or sea going certificate (Deck/Engr. )/ Shipping Management Certificate or equivalent qualification). Related Work Experience: 8 years varied experience in Tankers/Marine Operations, Chartering and Demurrage and Claims activities related to an oil industry.